Ballard Designs catalog is a free home decor catalog / furniture catalog that's filled with contemporary furnishings for your home. Throughout the Ballard Designs catalog, you'll find furniture, accessories, wall decor, lighting, rugs, tableware, outdoor living, linens and fabrics, and much more. Start by opening the Request A Catalog page on the Ballard Designs website. You must fill out that form with information about where to send the free catalog, including your first and last name, the full mailing address, and your email address. There's a place to enter your phone number too, but you don't need to fill that out in order to get the free catalog. If you see more than one catalog listed on the left side of the form, you should be able to click on them to choose which ones you want to have mailed to you. Otherwise, just the one they have available will be preselected for you. Note: If you look at the bottom of the request form, you'll see that you're also set up to be subscribed to emails from Ballard Designs. If you don't want to sign up for special promotions and new product alerts from them, just uncheck that box. You don't have to get their emails in order to receive the free catalog. When you're all done and you've filled out the information correctly, just click the SUBMIT button at the bottom of the page to request your catalog. It shouldn't take more than 2-3 weeks to arrive. Note: If instead of filling out the form you'd rather call Ballard Designs to order a free catalog, you should be able to through 1-800-536-7551. Ballard Designs catalogs can be mailed out to a number of countries all around the globe, including not only the United States and Canada but also Argentina, China, Greece, Malaysia, Saudi Arabia, and many many others. 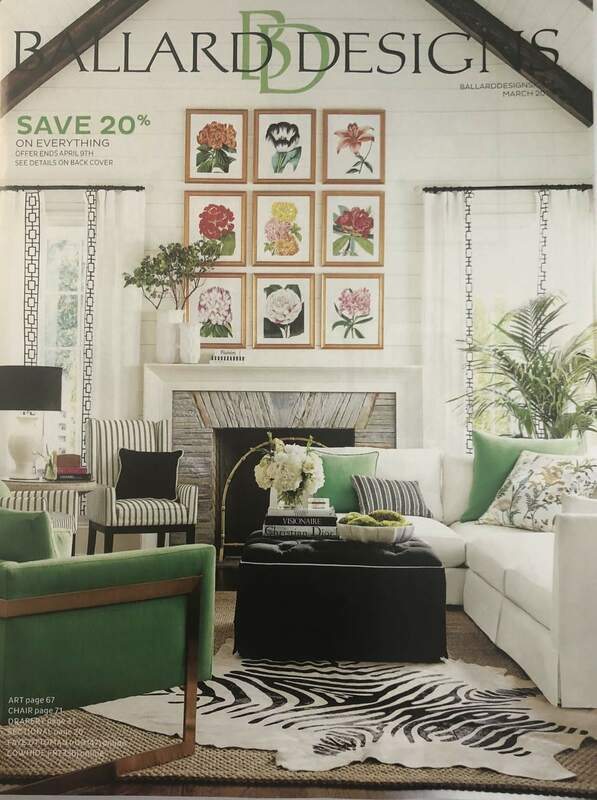 If you like Ballard Designs Catalog, you'll also like catalogs from ​Blair, Montgomery Wards, Brylane Home, Collections Etc., and Crate & Barrel. The catalog isn't the only way you can shop at Ballard Designs. You can also just use their website at BallardDesigns.com to add items to your cart and purchase them online. Some of the categories of items at Ballard Designs includes Furniture, Outdoor Living, Lighting, Fabric and Slipcovers, Rubs & Drapery, Bed and Bath, Wall Decor, Accessories & Pillows, Trends & Features, Tabletop, and Collections & New Items. There's also a category just for sale items, including weekly specials and coupons you can use when you checkout. Each of those categories has subcategories to help you find exactly what you're looking for. You can also sort the results by price to exclude things that fall outside your price range. The results in some categories can be adjusted by color, material, size, and other specific details. Note: Ballard Designs can ship to over 60 countries. On their website, at the very top of the page, just click the flag next to "Shipping To" to change where it is you'll have things shipped, in order to customize the website and currencies to that specific country.